Previous Joyce and Wordle: "A Few Wellchosen Words"
Presumably the publisher hoped to cash in on our confusion. After all, titles have to pop. And publishers serve two masters: commerce andcreativity, profit and art. Titles have to be memorable enough to stick with readers, yet clever enough to intrigue tastemakers. No easy task. Try too hard and you end up with something like House of Leaves. Do you get it? The house is really the book, cuz pages can be called leaves! Oh man, so clever! That one, at least to my ears, is a little too proud of its punning. Yet here I am, discussing it. Others titles have impressed me more. Here's a list of some of my favorites, and what I think makes them work. The Crying of Lot 49. Thomas Pynchon’s slightly paranoid novella has stuck in my brain since I first glimpsed its title. It must be that howling gerund with its long i sound and suggestions of pain. And then there’s the title’s sonorous quality. It begs to be spoken aloud. Try it a couple times. Really. Euonia. Okay, basically this title banks on obscurity. You probably hadn’t heard the word “euonia” before you heard about this book. It means “beautiful thinking.” It’s also the shortest word in English that contains all the vowels, which makes it a particularly fitting title for Christian Bök’s exercise in constrained writing. Each of the book’s five chapters uses only one vowel, beginning with a, ending with u. The book is a striking thing to read, especially the guttural u chapter. Life A User’s Manual. The intricate phenomenological descriptions that George Perec composed for this book—each chapter describing a single room in the apartment building where the protagonist, a recently deceased guy who liked jigsaw puzzles, lived—aren’t exactly what you’d expect to find in a typical user’s manual, but this is life, not a screwdriver. The title sticks with you because most novelists (not to mention most publishers) don’t have the nerve to put a technical sounding title on their novels; such a thing might dissuade impulse buyers. Watership Down. Amazing use of ambiguity here: you don’t really think of Watership Down, the hill, when you first read it. Instead, you picture a curious seafaring vessel, "down" as in sunk or in the process of going down. Then you read about rabbits and "hrair limits" and it all begins to make a bit more sense. But at that point, you’ve already been led down the garden path, and the title is ensconced in your memory. Those titles are solid enough to serve both art and commerce, I think. Of course, I doubt they’re as brilliant as my idea for a novel concerning self-motivating punctuation marks. 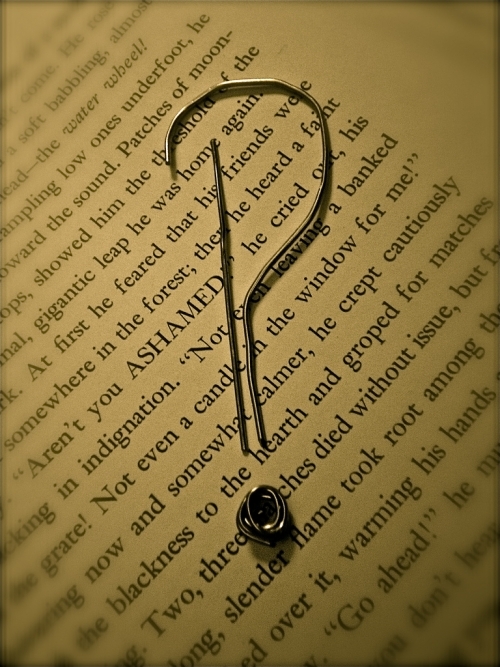 The title's not gonna be written out but set with the interrobang glyph. I'll let the critics argue about how to pronounce it. And yeah, the gimmick is that the narrator's deployment of punctuation marks evolves as her narrative unwinds. it'll be nigh unreadable, but oh so punny and witty. Beat that, internets.